Problem Statement: Worker tripped because he stepped off a sidewalk which caused him to lose his balance and fall and strike his knee against the side of the pavement. Why? Worker moved to avoid a temporary sign but failed to verify that the area to which he was moving provided sufficient space to safely walk on the surface. Why? Worker was distracted by a conversation he was having with his companions and committed an error. Why? The worker was distracted because he was discussing a safety issue with his colleague and customer. Why? The group was on its way to a lunch meeting. Why? Because there was no other time to have the meeting and also have lunch. Such facile, linear logic sure feels good, particularly because (whether we admit it or not) it leaves the injured party holding the bag, sprinkle in some creative case management and garnish liberally with administrative pressures to achieve zero injuries and you can substantially improve your safety performance without reducing your risk one wit. A sandwich board sign was placed on a crowded sidewalk that impeded pedestrian traffic. The height between the sidewalk and the parking lot was slightly higher than usual. The simplest explanation is that I wasn’t watching where I was walking and I fell. In other words: I screwed up and I got hurt, and to some extent I would have to agree. My first instinct is to admit that I needed to be more careful and watch what I am doing. But as pat an answer as that is, it doesn’t begin to tell the whole story. I WAS watching where I was walking, however, the sudden shift of the pedestrian traffic forced me to decide to move off the sidewalk (which would have meant walking into parked cars), collide with my colleagues (which would have forced them back into the sandwich board) stop until the path was clear (which would have risked having the people behind me collide with me), or step on the edge of the sidewalk and take care to maintain my balance). People take risks like this every day, heck I’m sure I’ve taken risks like that many times in the past and not been harmed. My assessment of the risks associated with my actions are that I probably won’t get hurt and if I do get hurt it probably won’t be serious; it’s easy to waive off any precautions as overly cautious. It’s tempting to see simplest possible cause as the proximate cause because if we do it absolves us of having to do anything meaningful in the way of prevention. If the proximate cause of the injury is my carelessness the organization need only tell me to be more careful. If complacency is to blame for an injury the organization only has to tell people to stop being complacent. But if the problem is complex the prevention is likely to be difficult if not impossible. Let’s look at the example of my fall. What could we do to prevent this convergence of hazards? A quick look at the hierarchy of controls is pretty disheartening. Realistically eliminating the hazards (heavy pedestrian traffic, cars parked adjacent to the sidewalk, a sandwich board blocking the flow) while possible isn’t feasible. We all know how hard it is to engineer out hazards once the bricks have been laid and mortar poured. Substitution is equally unfeasible, realistically the only thing we can substitute would be the sandwich board which the shopkeeper would likely resist any substitution, having selecting the sandwich board for its effectiveness and relatively low-cost. That leaves us with administrative controls ─ the police could ticket drivers for parking too close and blocking the sidewalk, outlaw sidewalk sandwich boards, or even establish rules requiring pedestrians to walk single file down the side-walk ─ and I think we can all imagine how effective these would be. I suppose we could require everyone to wear knee pads but count me out. So we are left with two choices here equally loathsome: either we can take the easy route and decide that my injury was the result of my own carelessness and remind me to be more careful, or we can decide that the injury was the result of many interrelated factors that combined to raise the risk of injury to a level where someone was bound to be injured, and make corrective action difficult if not impossible. It amounts to this, philosophically I believe as many do, that all injuries are preventable, but I also believe that sometimes preventing some specific injuries just isn’t feasible so individuals and companies decide it’s just better to live with the risk. Great article Phil – I think we have all fallen into the simplistic root cause trap. Likewise the simple control trap which can just shift the risk or make it worse. Ie remove the sandwich board – cafe owner loses business, has to lay off staff, spend less on food safety………. Phil, very enlightening. 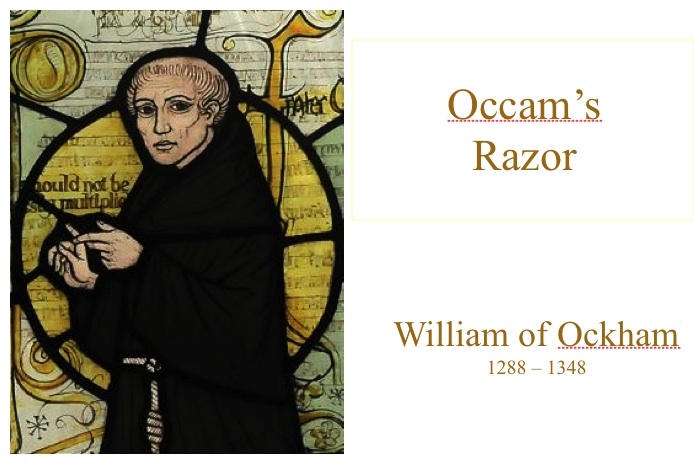 Although a student and often on the receiving end of Murphy ‘ s law, Occam’s Razor is definitely a new to me although the concept is not. Thank you for a compelling blog, the thematic and arguments presented resonate with my work. It reveals a significant deficiency within early training of the safety professional which universally fails to present safety within its context… namely organisations, operations and decision making – all of which are not simple. thanks for your insightful observations. You probably know this reference but just in case others are interested. It is a very interesting paper about workplace safety. I would encourage all those who are unfamiliar with Fred’s work. He was much maligned by the Safety establishment for his work.